TCI’s bush offers natural remedies for good health and healing. We know the saying “Beautiful by Nature,” but who knew we could be healthy by nature as well? When you step outside to view the natural plant life of the Turks & Caicos Islands what do you see? If you said, “bush,” you’re mostly right, but look closely. Scattered in almost every corner are powerful plants that can revitalize our bodies and minds. In fact, there are certain trees that grow locally which have the natural abilities to balance our bodies, boost our immune systems and heal us tremendously. 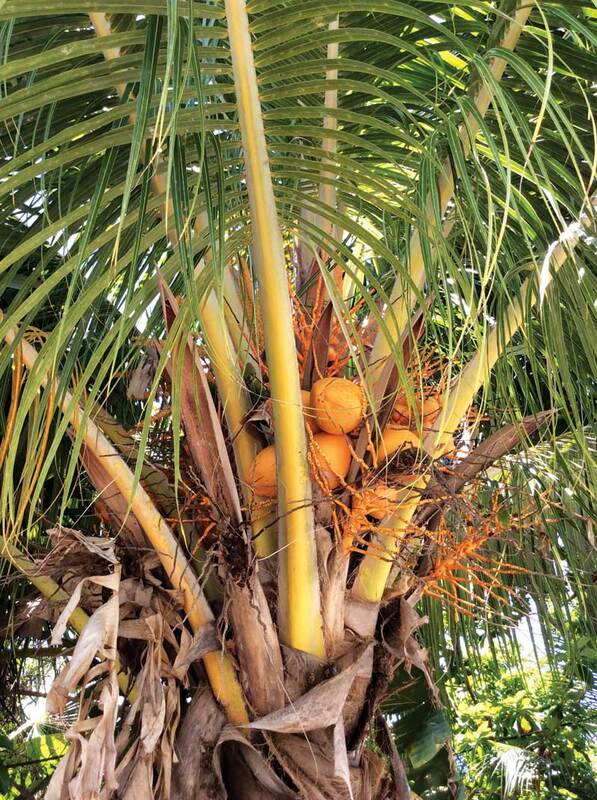 Four trees in particular meet these qualifications: the coconut, moringa, papaya, and neem tree. You may already have knowledge of some of these, while others may sound new to you. Yet these plants have been used for centuries by people of varying cultures and countries. They contain the essential vitamins and nutrients that can help us develop our body’s true potential. The great thing is that most of us have these trees growing right in our backyards! For many years, however, this tropical fruit has been wrongly thought to be unhealthy because of its high saturated fat content. A growing number of recent studies show that this is not the case. As it turns out, the type of fat within the coconut, medium chain triglycerides (MCTs), does not behave like your typical stubborn, unhealthy fat. When traveling through the liver, MCTs are immediately converted into fuel, which leaves very little amounts to be stored as fat in the body. • Shed those pounds—The water from the coconut can help you lose weight. It speeds up metabolism, giving you an instant energy boost. This delicious drink even suppresses the appetite, making you feel fuller, longer. It also reduces those midnight sugar cravings by improving insulin secretion and use of blood glucose. • Stay hydrated and energized—Move over Gatorade, there’s a new drink in town! Coconut water is more effective at keeping the body hydrated than other sports or energy drinks. When we exercise or do any rigorous physical activity, we lose mineral-rich fluids. Coconut water replenishes the body with 294 mg of potassium and 5 mg of natural sugar per glass; therefore it supports improved endurance during physical and athletic performance. Many sports drinks only contain half of the potassium content and five times the amount of processed sugar. Also, coconut water promotes healthy thyroid function and helps to relieve the symptoms of chronic fatigue. • Hangover remedy—This is a new one for me! If you have consumed too much alcohol, drinking a glass of coconut water can ease the symptoms that follow. It will settle your stomach and replenish the essential electrolytes that the body loses after frequent bouts of vomiting and urination. • Reduce blood pressure—It is known that an unbalanced level of electrolytes can lead to high blood pressure. Because coconut water contains an adequate supply of electrolytes, it is sometimes recommended that coconut water be consumed at the start of each day to promote electrolye balance. • Help digestion—If you have regular problems with digestion, drinking coconut water and eating its meat may provide a source of relief. Because of its high concentration of fiber, it aids in the prevention of indigestion and reduces the occurrence of acid reflux. • Glowing skin—For those combating acne or other blemishes, applying coconut water to the skin like a toner can go a great distance to clear up and tone the skin. It also moisturizes skin from within because of its ability to deeply penetrate cell walls. That is why products such as facial creams, shampoos, conditioners, and lotions that contain traces of coconut extract are more effective. • Improve heart health—Eating coconut meat can also help to protect against heart disease and stroke. Coconut meat has measurable amounts of vitamins A, E, and different flavonoids which all work together to decrease the levels of LDL (“bad cholesterol”). It is interesting that the indigenous people of Papua New Guinea and New Zealand, whose staple food is coconut, have no occurrence of stroke and heart disease within their populations. It is said that populations that eat a lot of coconut are among the healthiest people on the planet. You can enjoy refreshing coconut water in a tall glass on its own or add it to another drink of your choice. There is no rule on the amount of coconut water you should consume, but if drinking large amounts you should maintain an active lifestyle. When looking for the right coconut to enjoy, pass on those with a hard brown exterior and go for the young and green type. That way you’ll ensure that you get the most water and nutrients. 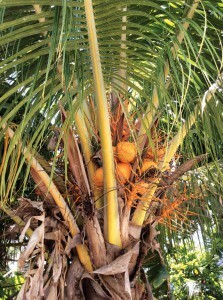 There is also the type of coconut with a yellow/orange hue, which is just as tasty as its green counterpart. Coconut meat can be eaten raw, cooked, or as a preserve. You can garnish your salads with shredded raw or toasted coconut meat. Blend your coconut with other fruits to make smoothies or add it in stir-frys for a tropical touch. The possibilities are endless. Coconut oil has also become the new health rage and for good reason. The lauric acid in coconut oil can kill bacteria, viruses, and fungi, which stops infections. The oil can be put directly on your skin or ingested. It works within the body as a natural antibiotic, killing harmful pathogens. The fatty acids in coconut oil have also been shown to boost brain function. In fact, research has shown better cognitive function and a reduction of symptoms in Alzheimer’s patients who take coconut oil. You can use coconut oil daily as a natural moisturizer for your skin, plus it doubles as a sunscreen, blocking about 20% of the sun’s ultraviolet rays. Make sure to choose organic, virgin coconut oil, not refined. Better yet, you can make your own oil at home; there are many tutorials online that can help you do this. Many people will look at you quizzically after mentioning the name “Moringa.” To be honest, it sounds more like a style of Spanish dance. This tree, however, has been used and highly revered in Asian and African countries for decades, and its health uses can be traced back centuries to ancient Egypt. 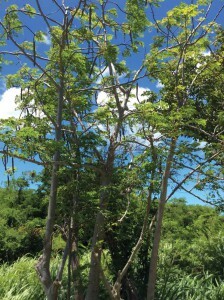 Because of its nutritional status, some have dubbed it the “Tree of Life” or even the “Miracle Tree.” Research shows that various parts of the moringa tree can be used to cure at least three hundred diseases, thanks to its more than ninety nutrients, forty-six different antioxidants, and all eight essential amino acids. This means that it is superb for giving your body the nutrients it needs and many times lacks as a result of an unbalanced diet. No doubt this is why moringa is given to children and adults in many African countries who are malnourished because they cannot access the nutritious foods and medicines they need. • Moringa is rich in vitamin A. It has four times more vitamin A or beta-carotene than carrots, so it is great for the eyesight. • Normally milk is said to be a rich source of calcium, but moringa has four times more calcium and twice the protein of milk. • Moringa is a rich source of vitamin C. It contains seven times more vitamin C than oranges. • Bananas are a rich source of potassium, but moringa leaves contain seven times more potassium than bananas. • Moringa has three times the amount of iron found in roast beef and three times that of spinach. •Control diabetes—Moringa balances sugar levels, hence it is helpful in the fight against diabetes. It is an excellent source of vitamin D, which is essential to help the pancreas secrete insulin correctly. Antioxidants in the moringa leaves and roots are also known to promote healing of diabetes-related lesions. Moringa is a rich source of ascorbic acid, which also aids in insulin secretion. Most importantly, there are no side effects to moringa use, so it is a safe, natural way to manage blood sugar and alleviate symptoms of diabetes. Furthermore, as diabetes causes circulatory problems and blood pressure issues, moringa has been shown to possess key anti-inflammatory benefits. • Combat the common cold—Moringa can prevent and shorten the life span of a cold. This is because the body’s natural defense mechanisms increase with the consumption of moringa in the daily diet. As an example, I drank Moringa leaf tea almost every night last year and did not catch a single cold! This is because it is a super immunity-stimulant. If your immune system is in tip-top shape, then you can avoid a number of illnesses. • Women’s health—Moringa is excellent for the different health problems that women may experience throughout their lives. Women in general are more affected by anemia than men. This tree contains high amounts of iron. It enriches anemic blood by increasing hemoglobin, which carries more oxygen throughout the blood. This is good news for women who are victims of lethargy and those who suffer from painful and/or long menstrual cycles. Mothers who took moringa were shown to produce more than two times the amount of breast milk than those who didn’t. Even hot flashes can be reduced or prevented because of the amount of vitamin E in moringa. • Cancer—Moringa can prevent formation of, or eliminate existing cancerous tumors because it contains benzyl isothiocyanate. Many scientific studies have shown that this chemical has anti-cancer and chemo-protective capabilities. People undergoing chemotherapy need these capabilities to help strengthen their cells and endure the treatment. But as they say, prevention is better than cure. • Brighten your mood—Taking moringa helps relieve stress and improves your mood, making for a healthier and happier you. The secret is in the tryptophan it contains, an amino acid your body requires for serotonin and niacin production—those feel-good elements. The combination of tryptophan, calcium, and protein in moringa makes it a virtual powerhouse of happiness. Almost every part of the moringa can be eaten, including its seeds which are also used to purify water. Most people, though, consume the leaves. The leaves can be eaten raw or cooked. While raw moringa leaves taste like radishes, cooked moringa is similar to spinach. You can add moringa to salads, pastas, soups, or, my favorite, lightly scrambled eggs with onions. It can also be easily made into a powder. After harvesting a good amount of the leaves, shred off the little leaflets and place them in an open container to dry naturally, or use a dehydrator for faster results. When dried, pulverize the leaves with a blunt kitchen utensil until they become a powder. Use the powder in yogurts and shakes, or to make the highly popular “Moringa tea.” Just pour hot water over the powder and leave it to steep. (You may use the green leaves as well to make this tea.) Moringa tea will provide you with a quick and natural boost of energy and build up your body’s defenses. There are no proven negative side effects of moringa tree leaves to date. They can be consumed by small children and adults alike. 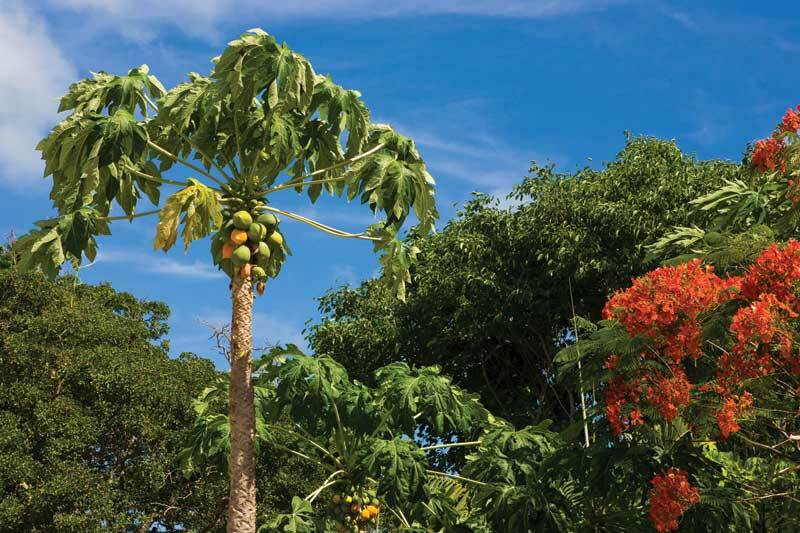 Papaya trees are literally “everywhere” in the Turks & Caicos Islands, and their nutrient-rich fruits are probably falling to the ground as you read this. Don’t let this precious plant go to waste. Papayas are not only rich in taste, but contain several unique protein-digesting enzymes including papain and chymopapain. These enzymes have been shown to help improve digestion and lower inflammation within the body. In addition, the antioxidant nutrients found in papaya, including vitamin C and beta-carotene, are also very good for reducing inflammation. Studies show that when people whose conditions are worsened by inflammation get more of these nutrients, the severity of their condition is reduced. • Boost immunity—A single papaya contains more than 200% of your daily requirement of vitamin C, making it great for your immune system. Your body will thank you as you fortify your natural defenses with this fruit. • Lower cholesterol—Papaya is rich in fiber, vitamin C, and antioxidants which prevent cholesterol build-up in your arteries. • Protect against arthritis—Eating papayas is good for your bones as they have anti-inflammatory properties along with vitamin C which helps in keeping various forms of arthritis from developing. A study published in Annals of the Rheumatic Diseases showed that people who consumed foods low in vitamin C were three times more likely to have arthritis than those who didn’t. • Prevent signs of aging—It seems like the phrase “anti-aging” is being slapped on every beauty product we see today. But real beauty experts know that beautiful skin starts from within. Healthy habits like eating a papaya daily will prolong the aging process and may make you look five years younger than you are! Its vitamin C, vitamin E, and antioxidants like beta-carotene will help prevent your skin from free radical damage, keeping wrinkles and other signs of aging at bay. • Help reduce stress—After working hard all day, it is a good idea to come home to a plate of papayas. As mentioned, this wonder fruit is rich in several nutrients like vitamin C, known to help regulate the flow of stress hormones. • Cancer prevention—Even the leaves of the papaya tree prove to be effective as a cancer preventative and treatment. In one study, papaya leaf tea reduced inflammation and activated immune system toxic effects toward cancer cells, inhibited tumor cell growth, and stimulated genes that modulate the immune system’s anti-tumor effects. In another study Papaya leaf extract has also been proven to increase antioxidant activity within red blood cells. Papayas can be enjoyed in many different ways. They can be eaten as is or added to a fruit salad or a host of different recipes. One of the easiest (and most delightful) ways to eat papaya is to treat it like a melon. After washing the fruit, simply cut it and scoop into it with a spoon. For extra zest, squeeze lemon or lime juice on top. Green (unripe) papayas can be used in salads and meat dishes and acts as a natural meat tenderizer. While most people discard the seeds, they are actually edible. Some find them to have a delightful peppery flavor; moreover they rid the body of parasites! They can be chewed whole or even blended into a creamy salad dressing. If you have a considerably large Neem tree in your yard you are probably fed up with cleaning up after it; the leaves, fruit, and blossoms seem to fall out continuously, leaving you and the rake more quality time than you’d like. But before you grab the chain saw, here are some facts you should know about this tree. Neem is a tree native to India and forms the foundation of Ayurveda, which is the ancient Indian practice of natural healing. Because of its wide spectrum of medicinal properties, it has earned the title, “Village Pharmacy.” The Neem tree is generally considered to be an air purifier and preventative against malaria. Leaves of this tree are a natural insecticide and having one in your yard will actually repel mosquitoes! As a powerful detoxifier, Neem leaves can cleanse the system, as well as fight against potentially dangerous viral and bacterial infections like fever and cholera if taken internally. (Neem, however, should not be given to children to treat fevers and should not be taken by women who are pregnant or trying to conceive.) The roots, bark, leaves, fruit, seed kernels, and seed oil are all used in therapeutic preparations for both internal and topical use. Its leaves are known to contain beneficial compounds like gedunin and nimbidol that have anti-fungal, anti-bacterial, and anti-inflammatory agents; these destroy fungi which cause athlete foot, ringworm, and nail fungus. • Skin Disorders—Neem is clinically proven to be an effective pain reliever and anti-inflammatory. These qualities are what make Neem so effective against serious skin conditions like eczema, psoriasis, acne, ringworm, lice, Candida, and more. When taken internally, the leaves prove super-effective because they detoxify the blood of impurities that are the source of skin problems. In the case of eczema, clinical studies have shown that even the application of weaker neem leaf extracts effectively eased the acute conditions of eczema, reducing itching and redness, while healing existing wounds. The leaves applied externally are a natural cure for those who suffer from acne, blackheads, and whiteheads. They can clear up acne, minimize pore size, and moisturize the skin all at once while lightening previous scars. Neem can also help the skin on your scalp. Applying neem leaf water as a hair rinse will treat dandruff and even reduce hair fall. • Fungal disease—Neem is also effective against fungal diseases that affect the human body. These include fungi that cause lung, bronchial, and mucous membrane infection. Neem leaves reduce the symptoms of fungal infections and oral thrush. Neem is also effective against fungi that infects hair, skin, and nails, incluing ringworm that occurs in hands and feet. 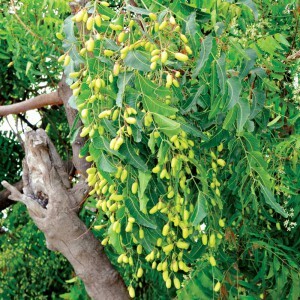 • Malaria—Neem is used to treat malaria fevers. One of its components, gedunin, is very effective for treating malaria. Even mosquitoes exposed to odors of crushed neem leaves suppress egg laying. Consuming neem leaves is an acclaimed treatment of malaria. • Arthritis—Certain properties of neem leaf, seed, and bark naturally reduce pain and swelling in joints. A soak in neem leaf water is great for relieving muscle aches and joint pain and helps alleviate rheumatism, osteoarthritis, and lower back pain. • Poison—Neem leaves are also effective in treating poisons and insect bites. This is due to anti-clotting agents that reside in neem leaf extract. • Cardiac care—Neem leaves are known to be an effective blood cleanser. They dilate blood vessels, improving blood circulation and decreasing elevated heart rates. They relax erratic heartbeats and control high blood pressure. One of the best ways to get the most out of this tree is to use the water from the leaves and drink it or apply it directly on the skin. Simply gather a few leaves and put them in water to boil until they are soft, discolored, and the water turns slightly green. Drink this as a regular tea; it will build your body’s immunity and relieve the symptoms associated with common viral infections including the common cold, chicken pox, and influenza. Gargling neem water can even soothe a sore throat. For topical use, dab a cotton ball in the leaf water and apply it to the face as an acne treatment or to other parts of the body that are affected. Soak tired feet in a tub of this water for relief or add some of it to your bath to relieve body aches. You can also make the leaves into a paste by crushing a few leaves with a little water. Apply this to your face as a mask or to areas that are injured or swollen. Take a look around you. Good health is at our fingertips. All we have to do is pick it, literally. These trees are not difficult to find or grow and seem to sprout up and endure in the harshest of environments. If you are unable to plant one, you can always pluck a few leaves or fruit wherever you see them (or from your neighbor with permission). I should stress, however, that it is important to incorporate these natural foods slowly into your diet and never overdose, as they can be powerful detoxifiers. Once your body gets all cleaned up and is used to them, you will definitely see and feel the difference. Learning more about these potent plants is just a mouse-click away, so do your own research on-line and take advantage of these trees. Plant them, and you’ll certainly reap the benefits.